We talked below how people like to deal with sites that are close to them – for example, UK searchers tend to visit .co.uk sites because they believe the site will be more relevant. Pretty logical stuff that helps remove barriers to making the sale. But what if you’re not actually in the same country as the market you are targeting? No problem – you can register a domain name with any extension (.com, .com.au, .co.uk, etc) without a problem. You can charge in any currency you like. Most visitors would have no idea. One area that used to be a little more difficult is having a local contact phone number. After all, if the site visitor looks at your contact details and sees an Australian phone number when he feels more comfortable with American sites, then that might cost you the sale. 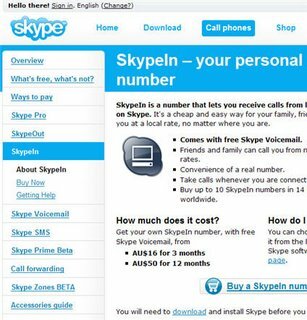 A very easy way to get around this is to create a Skype account (it’s an excellent Voice Over IP audio system that lets you call other Skype users for free from your computer and, for very low rates, you can call normal phone numbers). Once you have an account you can buy a phone number from a large number of countries. Cost is just $16 AUD for 3 months, or $50 AUD for 12 months. We have a US number – when someone in the US calls the number, it rings on my computer and I answer by pressing a button on the screen and speaking via my headset mic. With the crappy broadband we have here in Australia the call quality isn’t great. I generally get around that by having the messages going to voicemail and then calling the person back on a landline. So now you have a .co.uk domain name from 123-reg , you charge in UK £ and you have a UK phone number. 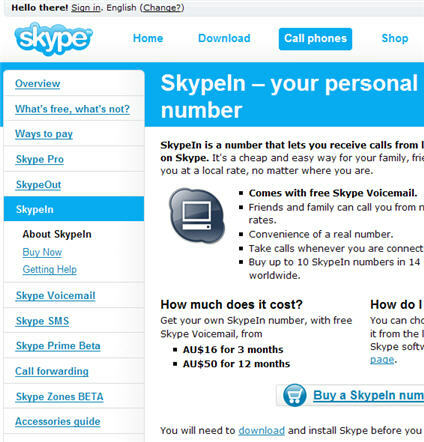 Total cost is about $60 Australian ($50 US) pa – $10 for the domain name and $50 for the Skype number. I’ve commented more than once about how I just don’t do business with companies who don’t bother to have a web presence. In addition, I avoid, whenever possible, the folks who keep their location and contact details semi-secret. I have a NetZero voice and vocemail number in my former US hometown and people leave me messages all the time … I publish the number, NetZero gives you something like 20,000 voice mails so if some spammy person leaves me a message, what do I care? One click deletes the message … and as far as many people I used to do business with are concerned, I’m still “in” Colorado. The voice mailbox solution is free, you cna have a voice call-out capability for about the same prices as Skype, $48 USD per year … works great.